Y-Knot Flowers is the floral division of Y-Knot Party & Rentals which has been designing weddings in the greater Phoenix Area for over three decades. Originally started April 1st, 1982 as the Y-Knot Shoppe in Tempe near Arizona State University, Y-Knot grew rapidly by providing wedding flowers to AZ residents, and began moving into successively larger buildings. Y-knot is now in a building with over 20,000 sq feet of Rental and floral design studio. After moving to Mesa in 2002, the Arizona flower shop has expanded to doing weddings, indian wedding flowers and special events in the entire Phoenix metropolitan area as well as Sedona and Tucson. Home to Ginia Lucas, Arizona’s only Master Wedding Vendor, ABC, Y-Knot has won awards in Tabletop design from Phoenix NACE Event Elements competitions three years running, has been awarded the Best of The Knot 2012, distinguished dealer for Carlson Craft every year for the past 20 years and is weddingwire.com certified. We are also a member of the Bettter Business Bureau, National Federation of Independent Businesses, American Rental Association, Greater Phoenix Convention and Visitors's bureau and The Mesa, Ahwatukee, Chandler and Gilbert Chambers of Commerce. Ginia Lucas, MWV is currently the Arizona State Coordinator for the Association of Bridal Consultants, www.bridalassn.com, a worldwide event planning organization and was previously the President of the Phoenix Chapter of the National Association of Catering Executives www.phoenixnace.com. 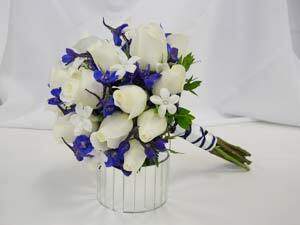 Y-Knot Flowers has specialized in Indian Wedding Flowers for over 15 years. We create fresh Varmaala, Mandap flower decor and Indian Aisle decor for the grand entrances. We have decorated Indian wedding ceremonies and receptions and some unique Mehendi flowers.